Okaaaaaaaay, it’s Monday people – are you feeling as energized and ready-for-action as me????? Well, whether you are or you aren’t I want to draw your attention to a very special project that needs your help! Cindy Illing is a dear friend and a very very special human being who is doing her bit to help parents through the grieving process after losing a child. As a psychologist I can tell you that the grief process is the most individual and the most difficult of human experiences. Those difficulties are compounded and multiplied after the loss of a child. 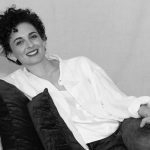 It is an unspeakable sadness at times and this is why it is so admirable and courageous that Cindy is putting her energies into helping give voice to parents’ struggles and triumphs following a child’s death. Cindy is very involved with PatchSA (Palliative Treatment for Children Africa), which “is an inclusive and compassionate network that aims to share specialised knowledge, tools and opportunities to ensure the best possible care for children with life-threatening and life-limiting illnesses, and to provide support to families and lay caregivers”. It is a highly worthwhile project, and just because Mandela Day was last week it doesn’t mean that it’s too late to lend a helping hand or drop off a donation. Cindy is on a mission to source fabric off cuts, bits of ribbon, lace, beads, fabric paint, etc that can be used to make the prayer flags. 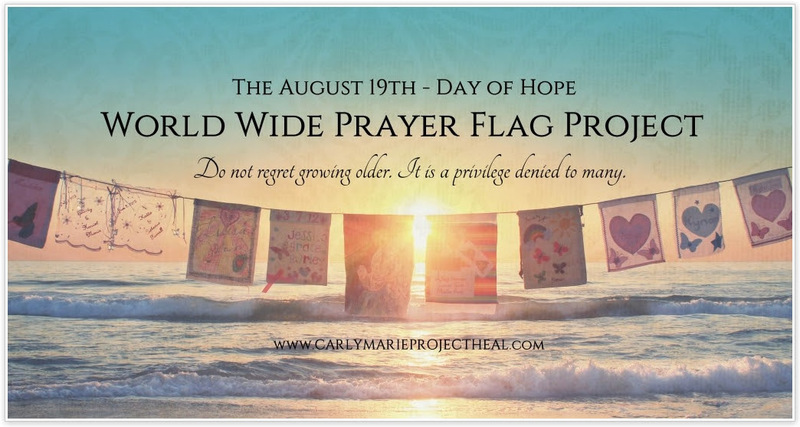 The August 19th – Day of Hope Prayer Flag Project is a profoundly moving, poignant and healing event to break the silence surrounding the death of babies and children. It is also an incredibly touching way to honour their lives. Each year we have thousands of people taking part across the globe, making this a truly inspiring event. The Project itself begins on July 1st and will end on August 19th 2014. You can join the Project at any point between these two dates. We invite you all to make a Prayer Flag in memory of your children that have died. In the process of making your Prayer Flag you are able to give yourself some time to honour your own personal journey and reflect on your grief and healing as well. On August 19th we will be stringing our Prayer Flags up in our homes, gardens or places that are significant to us, all over the world. We will then be sharing them in photographs and video clips with the rest of the world through social media. A Prayer Flag is a piece of coloured material. They are usually rectangular in shape. The Prayer Flags are often inscribed with mantras, prayers, messages, scriptures, blessings, names, words, poems or quotes. The tradition of hanging Prayer Flags dates back thousands of years. It is believed that once the Prayer Flags are hung up, the breeze takes the prayers and carries them all over the world. Prayer Flags hold a very sacred and beautifully divine energy. Who Can Join This Project: Anyone who has been touched by the death of a baby or child at any age or gestation is welcome to join. Just like last year, we would also like to invite the infertility community to join us too. For those of you who are living through infertility we invite you to make a flag to capture your own journey. You may want to make a Flag to express your grief with trying to conceive a child or you may want to make a flag of hope for the future, it is completely up to you. You may want to share this experience with your friends and family members or support groups. It could be a project that you all work on together. In saying that you can keep this project completely to yourself. There is no obligation for you to share this experience with anyone. Just do what is most comfortable for you. Take your time to make your Prayer Flags. Dedicate this time in your life to your children and to yourselves. You may want look for some inspiration before starting. Think about your children. Is there a certain colour that you associate your child with? Do you have a specific symbol for them? Think about all of the things that you could incorporate to represent the precious life of your child. You may want to searchPinterest for some ideas. You can sketch your design out on a piece of paper before you start working on your Flag. You may choose to simply cut and glue (like me!) or if you can sew or crochet, you may take that approach. When it comes to the actual time of creating your Prayer Flag – light a candle for your child and play some beautiful music or you may even want to make it in silence. Switch your phone to silent, turn off the TV. Make your surroundings as peacefu as possible. 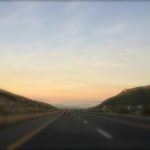 You may want to take photos as you go to document your journey. Remember to be mindful that this is to be a healing experience. It is not just about the very end result, but the journey. A rectangular piece of material around 9×12 inches in size: By us all having the same shape and size we can symbolize the unity in this community. We all have different stories (flag designs) but we have one common bond (Flag size/shape). 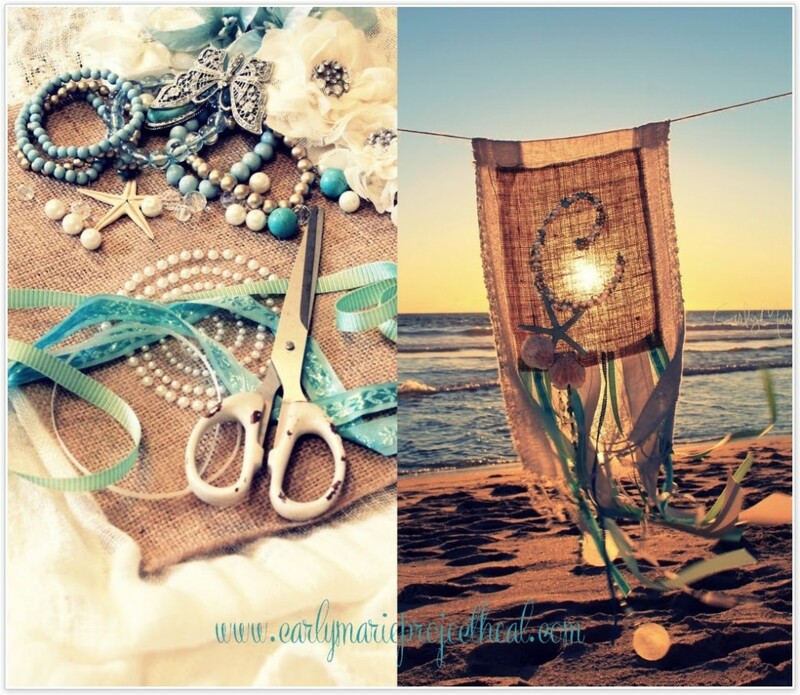 Creative Materials: You do not have to be super creative to take part in this Project. Things that you will need a pair of scissors, glue OR a sewing machine. I do not have a sewing machine, so for those of you freaking out, thinking you can’t take part… you can! You may want to paint your Prayer Flag or use coloured texters, stickers or other embellishments. There are no rules when it comes to how creative you would like to be with this Project. If you are looking for more inspiration you are welcome to browse through my Prayer Flag Albums that I created in 2012 when over 350 families from around the world sent us a hand-made Flag to be displayed at our Beach Remembrance Ceremony that we held in October 2012. What To Include In Your Flag: Take some time to think about what you would like it to represent. The most popular idea is to put your child’s name and special dates on the Flag. Some people include photographs, hand and foot prints. You could include a poem, love letter to your child or meaningful words. We had a few people create their Flags last year from baby blankets and clothes that were worn during labor. The creative possibilities here are endless. You may want to tell a story of your grief and healing journey within your flag. Some people like to write the names on their flag of all the people in their lives who have been supportive during their journey. How Many Flags You Can Make: We think it would be really lovely for us to only make one Flag per year. In saying this though, we want this project to bring the most amount of healing as possible and so if that means that you would like to make multiple Prayer Flags, please do so. We love that some people make one for their child and one for themselves to help inspire healing and hope. We are hosting the online event on Facebook. The event wall will open for people to post their Prayer Flags on, a few days before August 19th. Please note that all major updates will be posted on my facebook page. Where And When Do I Hang Your Prayer Flag: On August 19th – Day of Hope we will be sharing the photographs of our prayer flags hanging in all different parts of the world on social media. Where you decide to hang them is completely up to you. You may want to take them to special place, the cemetery, a beach, park, memorial garden or in your own home. I will be keeping the event open for a week after August 19th to give people the opportunity to share their Prayer Flags. Please feel welcome to share what part of the world you are from too! Project Updates: Throughout the next 2 months I will be featuring blog posts, instagram images and facebook posts from you all so please feel welcome to share your journey on my page under any of my posts. You can add photos in all of the comment sections. I will also be hosting a google hangout and a Prayer Flag making tutorial on youtube. If you want to keep up with any project updates please visit my facebook page here. You can subscribe to the page to avoid missing anything by hovering your mouse over the “liked” button. It should then drop down and give you the options to get notifications. Please Share The Project: Every year after this project comes to an end, we have so many people contacting us telling us that they found out too late. We want to avoid this as much as possible, so please share the event with your friends, family and support groups! This is a project that everyone can work on together. ALL DONATIONS WELCOME, BUT ESPECIALLY Fabric off cuts, bits of ribbon, lace, beads, fabric paint, etc that can be used to make the prayer flags. Hello friends, good post and fastidious arguments commented at this place, I am really enjoying by these. web I found this website as a most excellent site for most up-to-date updates. Very great post. I just stumbled upon your weblog and wanted to mention that I have really loved surfing around your blog posts. This kind of clever work and reporting! Keep up the wonderful works guys I’ve added you guys to my personal blogroll.